Hello and welcome to the 72nd installment of the SWD. Turkish Air Force targeted YPG’s, part of SDF positions around Mount Karachok near Al-Malikiyah (Derika Hemko) in northeastern Al-Hasakah governorate really close to Turkish border. Air Force reportedly targeted YPG headquarters where Media Center was also located and other localities. Official statement by YPG‘s General Command can be found here. According to the reports between 18 and 20 YPG soldiers were killed in the attack and another 18 wounded, there are also allegedly civilian casualties. Official statement by Turkish Armed Forces claimed 30 YPG soldiers were killed by airstrikes. Following this attack PYD closed Peshabur (Semalka) border crossing with Kurdistan Regional Government in Iraq. Situation in Al-Hasakah governorate (Al-Malikiyah is in the northeastern corner of the governorate). Source: Interactive Rurikmap which can be found here. Rebels in northern Hama have organized and reportedly resurrected defunct Jaysh al-Fatah operations room in order to stop SAA‘s advances from endangering rebel strongholds in the northern Hama governorate. Rebels’ counterattack started with an SVBIED on Masasnah which was then swiftly captured along with Jub al-Duktur checkpoint around Tayyibat al-Imam. 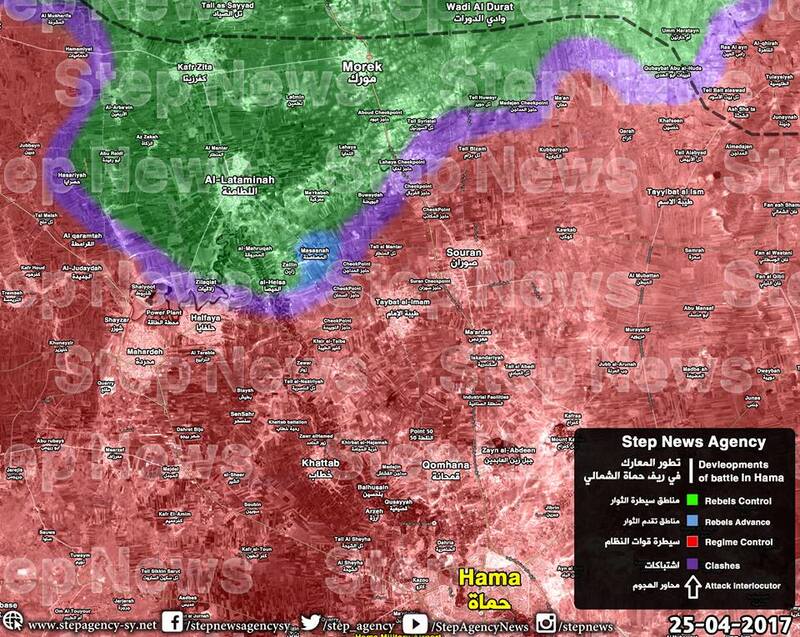 However, pro-government sources dispute these advances and claim Masasnah is under Syrian Arab Army’s control, as usual these advances should be treated as unconfirmed until either one of the groups releases footage proving their control over disputed locality. Once again ATGMs played a role in rebels’ “active defense line” before counterattack was launched as rebels fired three TOW missiles against SAA around Masasnah. One TOW missile launched by Jaysh al-Izzah destroyed a bulldozer while two missiles launched by Jaysh al-Nasr on a T-72 tank and a technical appear to have missed their targets. Other claims of destruction by rebels include a technical destroyed by Free Idlib Army with an artillery and a Kornet launcher destroyed by 23 mm gun also claimed by Free Idlib Army. Thirteenth of May, that is the date according to Homs Governor when Al-Waer neighborhood is going to be fully evacuated from rebels and civilians that don’t want to live under Syrian Government. Based on this information it seems that at least two or three more batches will leave towards Jarablus. Al-Bunyan al-Marsous shelled and tried to storm remaining SAA positions in Al-Manashiyah district, after heavy clashes rebels were reportedly able to capture more than 12 buildings in the northern edges of Al-Manashiyah and destroyed ZSU-23-4 (Shilka) in Al-Sijnah district. Rebels also started targeting SAA-held Daraa al-Mahatta district most likely from Karak neighborhood and destroyed a 23 mm gun. 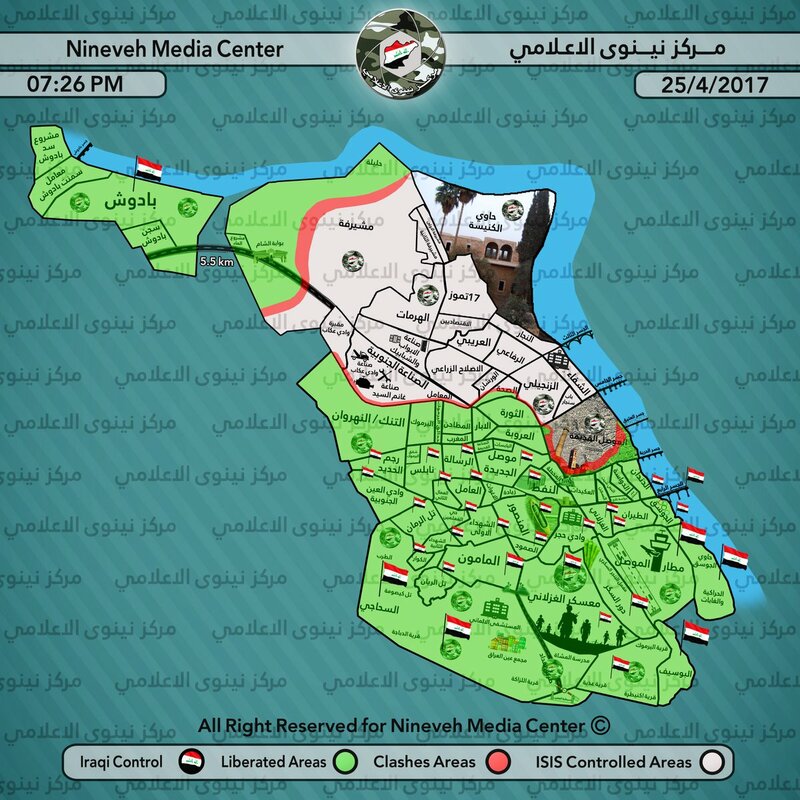 Iraq Joint Operations officially announced Al-Tanak (Al-Nahrwan) district in west Mosul as completely liberated from IS by Iraqi Army, district was reported as captured on 23rd of April. According to Amaq Agency’s statement IS launched a counterattack in Old Mosul district recapturing most of positions Iraqi Army held in Bab al-Toub neighborhood. Keep in mind that Amaq Agency is IS’ media outlet but for what it’s worth they have a surprisingly good reputation when it comes to reports. Turkish Air Force targeted PKK and YBS positions around Sinjar (Shingal) during the night, in the air attack one civilian was reportedly killed and another wounded along with one YBS fighter. Most of the reported casualties took Peshmergas the only “faction” in Iraq that Turkey is on good terms with, accidental Peshmerga casualties are five killed and nine wounded. Official statement by Turkish Armed Forces claimed that 40 PKK fighters were “neutralized” in Sinjar (Shingal) due to airstrikes. Al-Hashd al-Shaabi (Popular Mobilization Units) launched a large operation named Muhammad Rasul al-Allah (Prophet Muhammad Operation) against IS in Nineveh governorate southwest of Mosul. Big advances were made against IS in direction of Al-Hadhar and ancient city of Hatra where IS has been amassing troops as of lately and from where it launched several raids in Salah al-Deen governorate. Goal of this operation may be capture of Al-Hadhar area and desert south of it securing the Mosul supply route that gets attacked by IS periodically. If this is the goal of this operation it would also mean creation of buffer zone between Hawijah pocket and western Nineveh desert discouraging IS from launching further attacks aimed at establishing a route between the two for IS leadership to flee towards Syria. Localities captured by Al-Hashd al-Shaabi from IS today include Alwani, Ain Sadeed, Tal Halala, Jaf Khail, Tal Rajam al-Kabir, Tall Hilam al-Athari, Musaltan, Aleeba Sharqiya and Aleeba Gharbiya, Al-Dabeesa and Khanifis. Russia reportedly restored flight safety deal between Russia and CJTF-OIR, deal was suspended by Russia on 7th of April after the US targeted SAA‘s Al-Shayrat Airbase with 59 Tomahawk Land Attack Missiles in Homs governorate. On the 24th of April 2017 CJTF-OIR has conducted 24 strikes in Syria. CJTF-OIR‘s main focus in Syria at the moment is Tabqa-Raqqa-Deir al-Zour region where they did 22 strikes supporting SDF‘s operation against IS destroying four IS wellheads, 15 fighting positions, two heavy machine guns, two tactical vehicles, an IS vehicle and a command-and-control node. Other area where two strikes occurred is Palmyra destroying four fighting positions and two IS shipping containers. Full report on CJTF-OIR strikes conducted in both Syria & Iraq can be found here.